Security. It’s on everyone’s mind. CTO Magazine rated security as the #1 issue facing CIOs today. That means the security represents a great career opportunity for experienced IT professionals looking for a change. The Certified Information Systems Security Professional (CISSP) from the International Information System Security Certification Consortium, or (ISC)², is recognized as among the most valuable — and toughest — security certifications. In their current Guide to the CISSP, (ISC)² claims that CISSP-certified professionals earn an average salary of more than $130,000. The CyberSeek interactive cybersecurity supply/demand map of job postings showed that the CISSP was the most requested security certification. Earning CISSP certification is no walk through the park. That’s why we’ve laid out a study plan to help you be ready on exam day. CISSP is not for newbies. If you’re looking for a way to kick-start your cybersecurity career, the Systems Security Certified Practitioner (SSCP) from (ISC)2 and CompTIA’s Security+ are both good vendor-neutral entry-level certifications. Both also are U.S. Department of Defense (DOD) Directive 8570.1 baseline certs for Level II Information Assurance Technician (IAT) jobs. SSCP is also approved for Level I jobs. CISSP, on the other hand, is a certification for experienced security professionals. In many large organizations, CISSP certification is required for career progression. For the U.S. government, it’s a baseline cert for Level III IA Technician jobs — as well as for jobs at Level II or III Information Assurance Manager (IAM) and Level I and II IA System Architects and Engineers (IASAE). The CISSP covers eight domains from Security and Risk Management to Software Development Security. To be certified as a CISSP, you need to pass the CISSP exam AND have documented five years of paid, full-time employment in two or more of these domains. There are other ways to count CISSP experience, but you still need serious security work experience under your belt to qualify. The CISSP exam is available worldwide. The English language version of the exam lasts three hours and features between 100 and 150 multiple choice and scenario-based questions. A passing grade is 700 or more points out of a possible 1,000 points. You also must take the exam at an authorized testing center. Since 2018, the English language exam uses a more precise testing technology called Computerized Adaptive Testing (CAT). While you don’t have to answer as many questions, you get half the time to complete the exam. CISSP exams in other languages do not use CAT and last six hours and consist of 250 questions. CBT Nuggets provides a full range of training to help prepare you for CISSP certification. In fact, Keith Barker and Ben Finkel — two of our expert trainers — worked together to create a video-training playlist for CISSP certification. This playlist includes eight skills covering the eight domains associated with the exam. In all, it adds up to 95 CBT Nuggets videos and nine hours of training. To help reinforce and validate your learning, each skill includes both in-video and post-video quiz questions. Check out our recent blog post introducing Keith and Ben’s (ISC)2 CISSP 2018 training and watch a free Nugget on how to solve with identity management (IdM). So, you’ve decided to pull the trigger and study for your CISSP certification? There are nine hours of CBT Nuggets CISSP training. You can watch an hour of videos a week and get through our entire training in nine weeks. But there’s more to learning than just watching videos. You learn better if you reinforce your understanding through practical lab exercises — and test your retention with practice exams. Everybody learns in their own way, so your CISSP study journey needs to be personalized to your particular needs. To get started, we’ve put together a 9-week CISSP certification study plan. It leans heavily on CBT Nuggets CISSP training, combined with practice exams and other resources. In building this plan, we aimed to include about an hour of video training per week — more or less. CBT Nuggets training should not be your only resource to prepare for the CISSP. This is a tough exam. It’s not a technical exam. It’s a management exam. 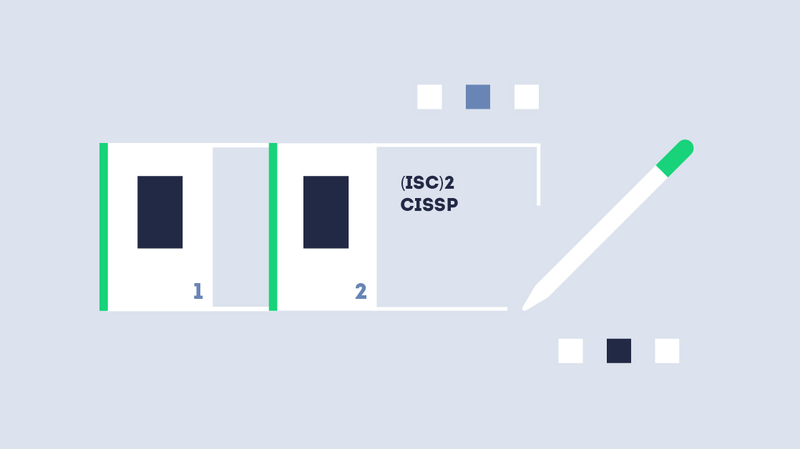 Like the PMP or ITIL, the CISSP validates whether you can look at security issues through the lens of (ISC)2 methodologies. Nine weeks is a good starting point, but you’ll likely need more time. How much time? That’s dependent on what you already know, and how long you’ve been on the job. Take a practice exam. It’s good to establish from the get-go what you do and don’t know. So, your first step should be to take a practice exam. You can either buy the Official (ISC)² CISSP Practice Tests book or use the Kaplan® IT Training practice exams that are included with a CBT Nuggets subscription. Whichever route you take, your practice exam results will help you establish a knowledge baseline. After each video, reinforce your learning by answering the practice questions for the modules in either the (ISC)2 or Kaplan® IT Training practice exams. The latter, of which again, are included with a CBT Nuggets subscription. Weekly time commitment: 4 hours. The Kaplan® IT Training practice exam should take you about two hours. The 11 video Nuggets are 50 minutes long. Start this week by watching the final four video Nuggets from the Information Security: Security and Risk Management skill. They cover intellectual property and licensing, threat modeling, supply chain risk management, and policy lifecycle. Next, watch the Information Security: Asset Security skill. Keith covers the critical issues of asset security, including privacy protection, asset retention, and data security controls. Weekly time commitment: 1 hour. The Asset Security skill includes seven videos for a total of 35 minutes. Combined with the four Security and Risk Management videos, week 2’s training should take 58 minutes. Symmetric and asymmetric encryption and keys. Weekly time commitment: 1 hour. These 12 video Nuggets consist of a totaled 62 minutes. This week, you’ll round out the Information Security: Security Architecture and Engineering skill by watching videos 13 through 17. You’ll learn how to mitigate vulnerabilities in web-based systems, mobile systems, and embedded devices. You’ll also learn how to apply cryptography. Secure communication channels, such as remote access. Weekly time commitment: 1 hour. The Communication and Network Security skill includes six videos that total 38 minutes. Combined with the five Security Architecture and Engineering videos, the Week 4 videos will take a total of 59 minutes. You’re now at the midway point of the CISSP security domains. It’s time to take your second practice exam. Although you could just test on the first four domains, we recommend you take the complete exam. You’ll get a better idea of how well you’re learning all the content. The exam results will also help you determine which domains might need a little more attention a second time around. Authorization mechanisms, such as role-based access control (RBAC) and mandatory access control (MAC). Weekly time commitment: 4 hours. The nine IAM video Nuggets total 50 minutes. If you tack on another full-length practice exam, add three hours to this week’s studies. This week has you finishing up the Information Security: Security Assessment and Testing skill. You’re also going to take your first bite out of Information Security: Security Operations skill. The Security Assessment and Testing skill is quite short — six video Nuggets totalling 29 minutes. Key topics you’ll learn include vulnerability assessments, penetration testing, log reviews, and security audits. The Security Operations skill is 27 videos long and will take more than two hours. For that reason, we’ve spread it over three weeks. This week, you’ll watch the first nine videos covering the that skill. You’ll develop an understanding of security operations, while learning the components of investigations, such as evidence collection and digital forensics tools. You’ll also get a brief introduction to implementing disaster recovery and business continuity plans. Weekly time commitment: Slightly more than 1 hour. The Security Assessment and Testing videos combined with the first nine Security Operations Nuggets, means Week 6’s videos will take about 68 minutes to watch. Weekly time commitment: 1 hour. These 13 Nuggets total 62 minutes. Once you’re satisfied that you understand these topics, move on to the final CISSP domain — Software Development Security. This is also where Keith hands over teaching responsibilities to Ben Finkel, our software development expert. Throughout the Information Security: Software Development Security skill, Ben will help you understand of software development security, while covering topics including securing the software development life cycle (SDLC), assessing the security impact of acquired software, and applying coding standards. Weekly time commitment: Slightly more than 1 hour. The final Security Operations videos, combined with the eight Software Development Security videos will take 72 minutes. It’s a little more than an hour this week. But take a bow, your final week of study is complete! Week 9: You’re Finished with CBT Nuggets Training! Following completion of all of the CBT Nuggets CISSP skills, it’s time for another practice exam. Now, you will be able to fully assess what you’ve learned — and identify additional review areas before you sit for the official exam. Be sure to go back to individual videos as needed to reinforce or review your knowledge. Weekly time commitment: 3 hours (at least). To sit for another full-length practice exam and give yourself at least three hours. You can easily finish CBT Nuggets training in 9 weeks, but don’t stop there. The CISSP is a tough exam with notoriously difficult questions. Keep studying until you’re consistently passing CISSP practice exams and feel comfortable with the minutiae of the (ISC)2 methodologies. What if You Don’t Have the Experience? If you choose to take the CISSP exam without the required five years experience (or four years with a college degree), you can pass it and be recognized as a CISSP Associate. You’ll have up to six years to build up your required five years of domain experience. Becoming a CISSP Associate might not help you get a job in the commercial sector. However, the CISSP Associate is accepted by the U.S. government for those IAT, IAM, and IASAE jobs we mentioned earlier. CISSP certification may not be right for you. There are other security certification options that might serve you better, dependent on your role, your organization, or your career aspirations. IT Security Certifications: The Breakdown has useful info on the range of vendor-neutral security certifications that are available — including CISSP. If you’re trying to decide whether CISSP certification makes sense for you, you should also review the (ISC)² Ultimate Guide to the CISSP. This will give you additional information on the steps to — and benefits of — becoming a CISSP. For further information on the CISSP exam itself, download the CISSP Exam Outline and review in detail the exam topics covered under each of the security domains. Becoming CISSP-certified is not a simple process. (ISC)2 has a lot of hurdles — work experience, exam, endorsement — that you must square away before you get your badge. If security is where you have earned your spurs and where you want to advance, acquiring your CISSP certification is a no-brainer. It takes one push to get started on your (ISC)2 CISSP journey. Start with our (ISC)2 CISSP 2018 training and carve your path to certification today.